All Electric Chauffeur Services has launched a short-term vehicle rental product for fleets to try their Tesla Model S vehicles on a real-world basis. Strong demand from the corporate sector, London hotels and wealthy individuals means that the fleet is due to double in size in the coming weeks with the company planning to operate a 25-strong fleet of 100% electric cars by early next year. Corporate and private sector demand for plug-in vehicles is rising dramatically with registrations up almost 140% in the first nine months of 2015 versus the same period last year, according to latest SMMT figures. However, All Electric Chauffeur Services believes that demand could be even greater if fleet decision-makers and company car drivers were able to test drive plug-in cars in real-world driving conditions - including experiencing the recharging process - over a 36 or 48-hour period or even longer on special request. 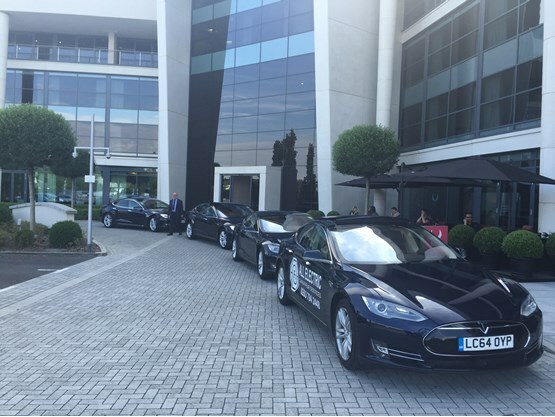 As a result, through All Electric Chauffeur Services’ parent company Berkeley Square Vehicle Solutions, the corporate sector as well as retail customers are now able to hire one of the company’s Tesla cars with day rates available on application. The car will be provided fully charged and hirers will only have to add the vehicle to their own insurance and return it fully charged. A chauffeur can be provided if required. The hire service will initially operate inside the M25. Vehicle delivery to customers includes a comprehensive familiarisation package. Rowley concluded: “The government is spending millions of pounds in encouraging demand for plug-in vehicles through purchasing grants and the funding of recharging points nationwide. What’s more we have seen in recent weeks with the furore over diesel vehicle emissions that air quality is a major concern for many people.